I have been to my McEwan grandparents’ grave at Pinecrest Cemetery so many times … from my first visits at age 4 when my Mom went to plant flowers there. Yet, depending on the amount of time between visits, I can sometimes spend 15 minutes finding the stone in their section! It’s not memory loss! It’s just that in large cemeteries that don’t have any distinguishing section markers, a bush that has been removed or a tree that’s been cut down … well, it changes the (mental) landscape. One great thing on the internet, for those researching their family, are the several sites that offer photos or transcripts of gravemarkers. It’s not just being able to see a burial place that one hasn’t, or can’t, visit. The stones often reveal a tremendous amount of information that can help push forward family tree research. In the Ottawa area, I often used Scott Naylor’s site to locate my ancestors. I had used it so often that I decided last year I should send him a “thank you” email. I was saddened to learn of his death. So let this post be a sort of public “thank you” not just for myself, but for everyone who benefitted from Scott’s work, and that of his collaborators. Scott knew the value of his work, and made arrangement for it to be incorporated into another gravestone site: Canadian Gravemarker Gallery. If you know the cemetery or town of the person you are researching, you can begin at the Canadian Gravemarker main page. If you only know the province, there is a province-wide search page. The site’s search engine is a little quirky. You have to remember to conclude any search term with two asterisks — like this mcewan** otherwise you will get a “no results” report. 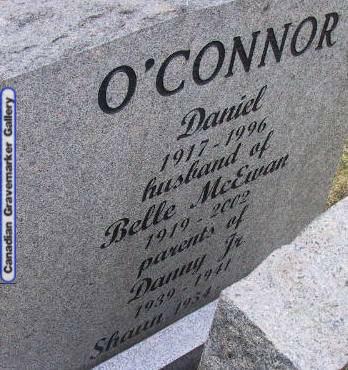 Another equally helpful site is Canadian Headstone Photo Project. Another resource is the Find A Grave website. It seems that, as of late, a number of folks are using this in a similar way to an ancestry.com tree. The site allows for a page with gravestone photos and lists of relatives and connections, together with a brief bio. If you are fortunate enough to locate someone through this resource, it usually includes both other relatives’ names and a way to contact the person who created it !